Payut Ngaokrachang's Sudsakhorn Adventure (สุดสาคร) will be shown at the Thai Film Archive in Salaya on 26th and 30th June. Both screenings are free. In his definitive global history of animation, Cartoons, Giannalberto Bendazzi praised Sudsakhorn Adventure's "suggestive, modern interpretation of the country's graphic tradition." Unfortunately, in the book's second edition, Animation: A World History, Bendazzi revised his opinion: "apart from its decorative qualities, the film is an artistic failure." 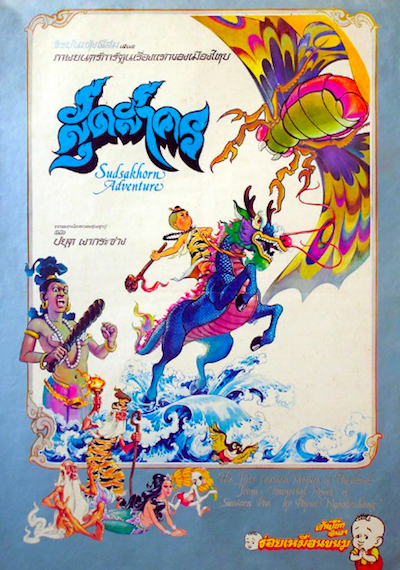 Nevertheless, Sudsakhorn Adventure remains a milestone in Thai animation, as the country's first feature-length cartoon.